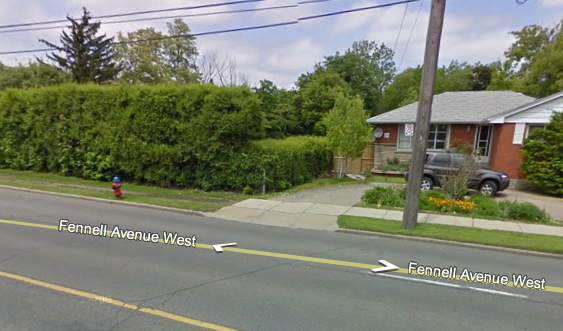 Fennell Avenue West has no sidewalk on its north side from West 2nd Street to Auchmar Road. This is in spite of the fact that this section of Fennell is directly in front of Mohawk College, which is full of students, especially young students, many of whom rely on walking, cycling, and public transit to get around. So it's no surprise that instead of a sidewalk, there is a path so well-worn it's clearly been travelled by thousands of people. The strange human desire to be able to walk from one point to another in the shortest way possible, combined with the City's apparent disregard for pedestrians on Fennell, has helped create the riskiest section of the path, at the north-east corner of Fennell and West Fifth Street. 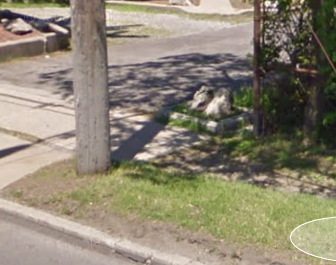 At this corner, a two-meter high decaying retaining wall abuts the street. People walking on this side of the street have trod a path above the wall, which in icy winter conditions requires the nerves and agility of a mountain goat to traverse. Slip and fall and you've got 60- or 70-kilometre/hour traffic to contend with. 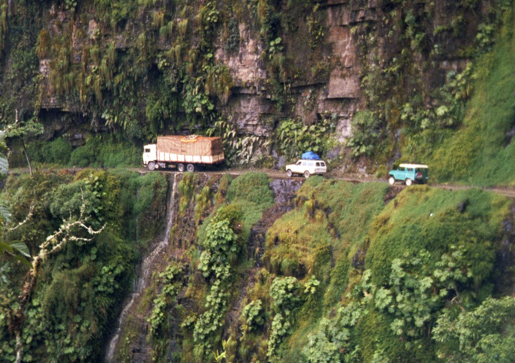 North Yungas Road. Image Credit: Wikipedia. 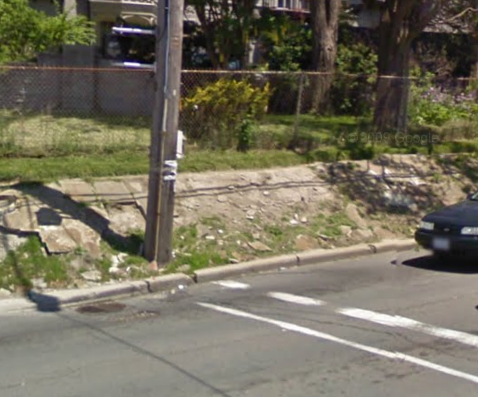 Of course in Hamilton we don't make cars traverse this type of terrain. We save the risky stuff for people who are walking. In both cases, to get to the little patch of concrete on the north side of Fennell, you either have to use the path or dart across 4 lanes of traffic. This reminds me of comments Constable Claus Wagner, Hamilton police traffic safety and centralized breath testing co-ordinator, made when The Spectator asked him about rising pedestrian deaths in Hamilton - nine in 2010. "We did a couple of projects this year with pedestrians," says Wagner. "We've had a lot more complaints about people crossing in different areas and things like that." "I don't know if it is people don't look any more, because even though you have the right of way you should still look ... just like driving a car ... some just walk right out." Perhaps part of the problem is that you have to dash across traffic to get to little pedestrian islands where you can access bus stops, or that you need mountaineering equipment to travel on foot when we get any decent amount of snow in the city, or that cars travel too fast here. Unfortunately, when it comes to traffic engineers - you know, the folks for whom pedestrians are an impediment to traffic as opposed to a legitimate type of traffic themselves - these possibilities don't seem to be registering. The "new" Wal-mart and big box centre on Upper James and Fennell is also woefully pedestrian unfriendly. You have a former mall, which serves as a nexus of bus stops, has apartments across the street, residential housing all around, and of course they decided not to take into consideration pedestrians when designing the new layout. For this reason there is no sidewalk access to Wal-Mart itself, or half the other buildings for that matter. Neither are there safe "crossing" areas for pedestrians navigating their way through this big box site. I know people have already been hit by cars at this location (I saw an injured woman and her lawyer taking pictures of the area when it was still under construction). Apparently now that they have received so many complaints they are "looking into making the area more pedestrian friendly." I put the blame squarely on the city. Who was it at the city who thought that such a pedestrian-unfriendly plan would be a "good idea?" Why didn't they require Smart Centres to design the area in a manner that one can actually navigate around it from store to store without getting run over, or without having to get back in your car? Then again, when you look at the Fennell Avenue West, above, you realize that the developers themselves are only following the example set by the city. I know that both Mohawk and the health centre across the street are in the midst of construction. There are always hopes and rumours but nothing concrete, regarding Auchmar. Hopefully while the construction is happening, and whenever they figure out what to do with Auchmar, they city can put in some proper sidewalks at the same time. I agree Robert, that the blame lies solely with the city on these rotten designs. Does anything think that Walmart, Shoppers, Canadian Tire or other big chains design nice stores in other cities out of the goodness of their hearts?? No, it's because there are design guidelines and architectural standards as well as transportation standards that are taken into account and ACTUALLY enforced by these cities. If the companies don't want to meet the standards, they can take their store to another community. And guess what - since these stores WANT new locations to make more money, they are more than happy to spruce up the design a little in order to satisfy their particular city council. Our lack of vision and care about this city starts right at city hall...and runs rampant from there. If city hall cared about how Hamilton looked and functioned, we could get good urban design here. Instead, we keep plopping the Meadowlands down all over town and pretending that bad 1990's urban design will somehow improve with each passing decade. Terry Whitehead's ward. Pedestrians flip flop along the street while Whitehead flip flops in the council chamber. Always think it's sad that wards 7 and 8 seem to have the least interest in developing pedestrian and cyclist friendliness when they're the wards that seem to have increasing intensification and infill going on. I walked along here weekly when I was taking a night class at Mohawk last year. I would just add that the Garth/Beckett corner was unnerving as a pedestrian - the sidewalk is so narrow and you have blinding car headlights coming right at you and a retaining wall behind: made me feel like a target in a shooting gallery. Even on the Dundurn stairs I felt vulnerable, in the last year at least two vehicles have driven north i.e. over the edge. Really eye-opening article, especially given all the student pedestrians I see around there. Is anyone sending this article to anyone at Mohawk? I fully agree, the area around Fennel and West 5th has always lacked proper sidewalks, and frankly it's ridiculous. Every road in Hamilton apart from the 403, the Linc, the Red Hill and Burlington Street should have proper sidewalks. 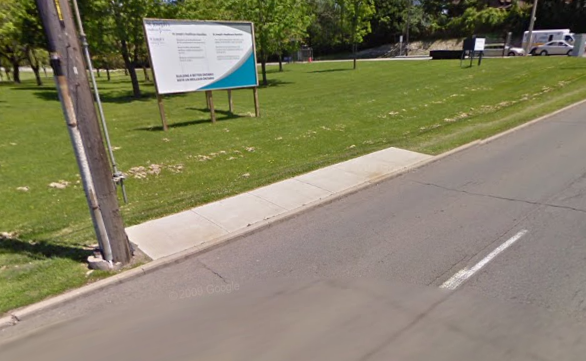 There should be a sidewalk running all the way from Governor's Blvd linking up to both the Clairmont Dr. sidewalk and the nearby Bruce Trail access. There should also be continuous sidewalks on both sides of Fennel between Garth St and Upper James as well as the Hillfield side of Garth St.
Another area is higher up on West 5th after your pass the Linc, part of the sidewalk is decaying blacktop and further up in turns into Gravel shoulder. I just don't understand why the city has refused to address these issues for so long. How do they ever expect to develop the empty field that's there if they won't put in a proper sidewalk? It's not like putting in new sidewalks is going to break the budget and it's going to create at least a couple of extra construction jobs for the city. I'm sure there's lots of places on the Mountain this is the case. I know one family who bought a lot and custom-built a home accessible for their daughter (who's in a wheelchair) next door to their old one on Upper Wellington. They've now been promised sidewalks for about a decade and they're still waiting. The sidewalk still ends a half-dozen houses before their door. Everywhere in Hamilton, there's tiny little patches of pavement that just aren't there, sacrificed for the Red Hill and Linc. Some are sidewalks that vanish. Others are big pot-holes in the middle of downtown roads. Crosswalks are missing too, as are bike lanes and many lanes of two-way flow on new downtown "conversions". There are only so many dollars and hours available to our traffic department, and every one spent on is another one not spent on on pedestrian or cycling issues. Contrary to the above, there are concrete plans for the Auchmar estate. Please Google the recent article in the Mountain News. The precise role of the mansion house has not yet been determined but the city has fully committed to the restoration project. 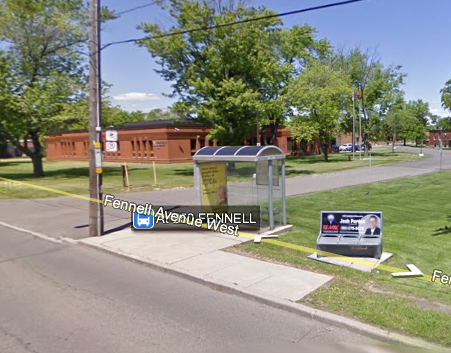 As far as a sidewalk along the north side of Fennell Avenue is concerned, anybody intelligent enough to get into Mohawk College should be intelligent enough to walk on the south sidewalk if he deems the north side route unsafe. Really, what whining! Are we to spend millions digging up a historic landscape (alongside both Auchmar and the HPH) to coddle a cyclist who mistakes himself for a mountain goat? Bill King, how are you supposed to get from the north to south side.. Jump? Are there crosswalks available where the sidewalk disappears? You can't have your cake and eat it too. Here's a good one. From King Street (Jackson Square), How do you get to the bus stops at the New & Improved MacNab bus terminal without jaywalking in the bus lanes? There's a nice bunch of bushes and the MacNab bus terminal sign at the north end of the terminal which forces people to jaywalk. I've only been there once .. am I missing something? Adam2: I would suggest that you wait for a gap in traffic sufficiently large to enable you to walk across the street, and then do so.